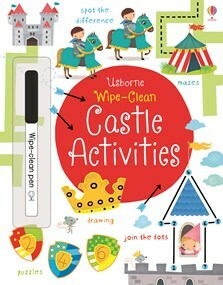 A colourful activity book full of castle scenes with mazes, dot-to-dots and drawing puzzles to help little children develop the pen control skills that are essential for learning to write. Each scene features a fun medieval castle scene, from the workshop where knights’ armour is made to an exciting royal tournament. Children can follow the dotted outlines to draw spectators at a joust, a knight’s horse, the winding route to the castle through a nearby village and lots more. A fun way for young children to develop counting, observation and pen control skills.